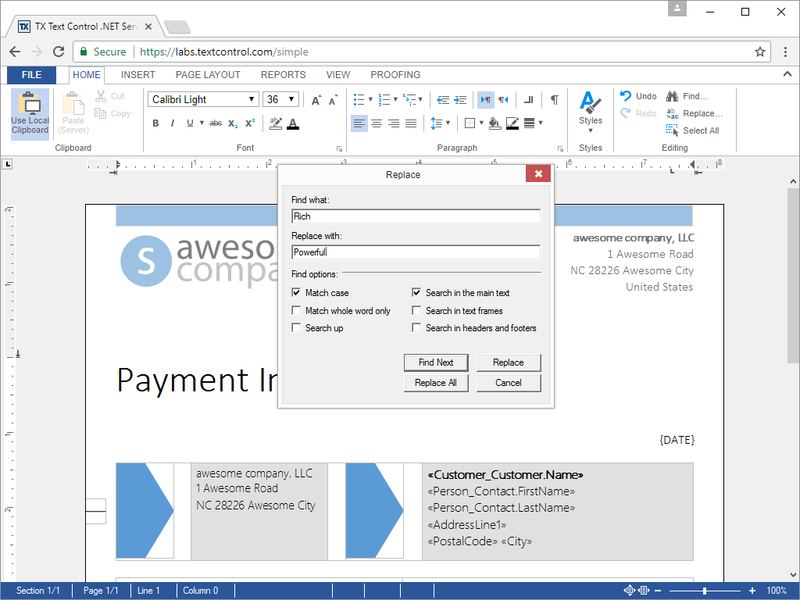 Give your users a WYSIWYG, MS Word compatible, HTML5-based, cross-browser editor to create powerful reporting templates and documents anywhere - in any browser on any device. Text Control Reporting combines the power of a reporting tool and an easy-to-use WYSIWYG word processor - fully programmable and embeddable in your ASP.NET application. The DocumentViewer provides a very easy way to display the contents of a reporting and document and to navigate around a document within a web browser. Every aspect of the editor can be customized, documents can be created without any UI using an API and custom logic and code can be injected while merging templates. TX Text Control .NET Server for ASP.NET provides comprehensive support for bullets and numbered lists. Typical applications areas include the creation of documents containing meeting minutes, reading lists or to do lists. 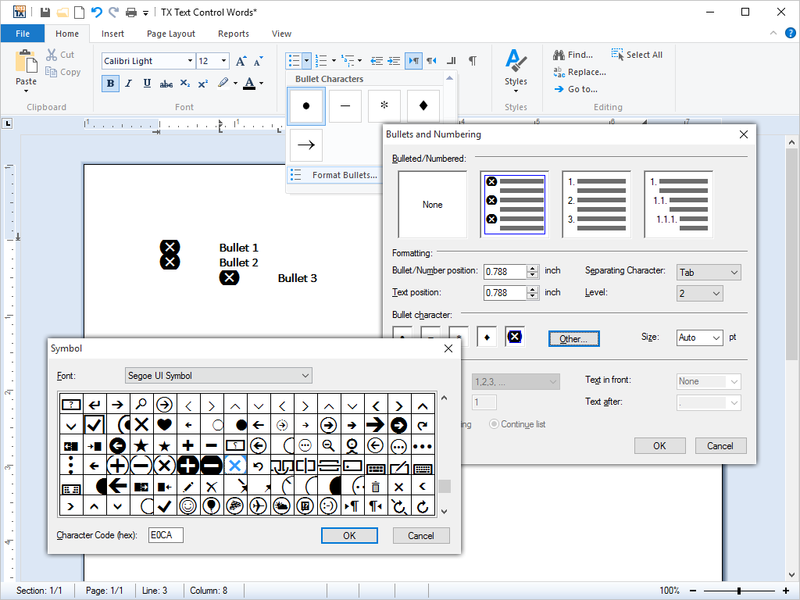 Virtually every conceivable attribute of the bullets and numbered lists can be user defined, including the type and shape of bullet directly from program code. Numbered lists and bullets may contain any of TX Text Control .NET Server for ASP.NET vast formatting options. 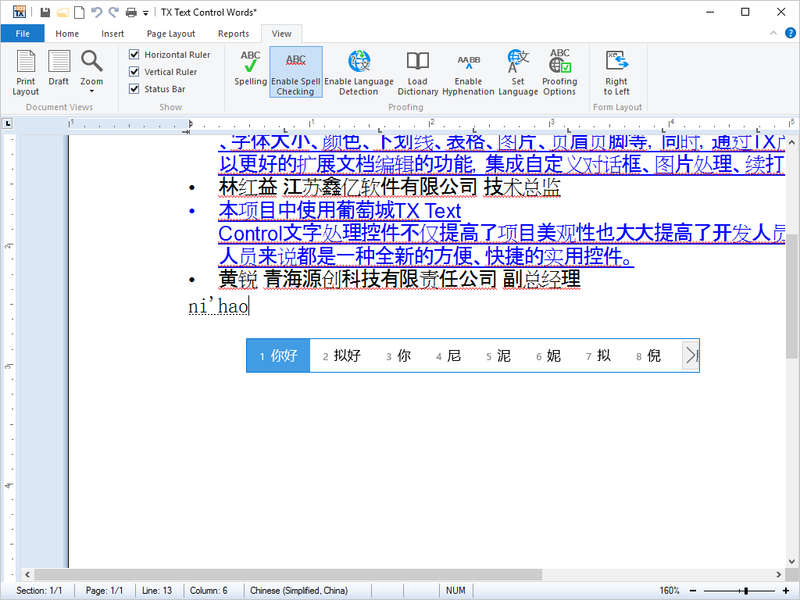 TX Text Control .NET Server for ASP.NET offers all the formatting control over character and paragraph presentation and that you would expect from a fully fledged word processing package. Applications created with TX Text Control .NET Server for ASP.NET provide rich character formatting options, including font size, font family, character style, foreground and background colors etc. All formatting options can be combined with one another, making the possible formatting options almost infinite. Flexible paragraph formatting such as indentation, many types of tabs, variable line and paragraph spacing, and paragraph frames offer a variety of formatting opportunities. Keep with next: By selecting this option, an end-user can force TX Text Control .NET Server for ASP.NET to place the current paragraph and the preceding paragraph on the same page. Keep lines together: If the end-user selects this attribute, TX Text Control .NET Server for ASP.NET places all lines of the current paragraph on the same page. TX Text Control .NET Server for ASP.NET does not break this paragraph, but keeps it intact. Page break before: If the end-user selects this attribute, TX Text Control .NET Server for ASP.NET places the current paragraph at the top of a new page. Widow and orphan control: Widow and orphan control options can be set by developers and end-users. The number of lines that are considered to constitute a widow or orphan can be specified. TX Text Control .NET Server for ASP.NET offers end-users access to all formatting options directly from the shipped dialog box. The document sections feature of TX Text Control .NET Server for ASP.NET allows documents to be divided into an unlimited number of different parts. 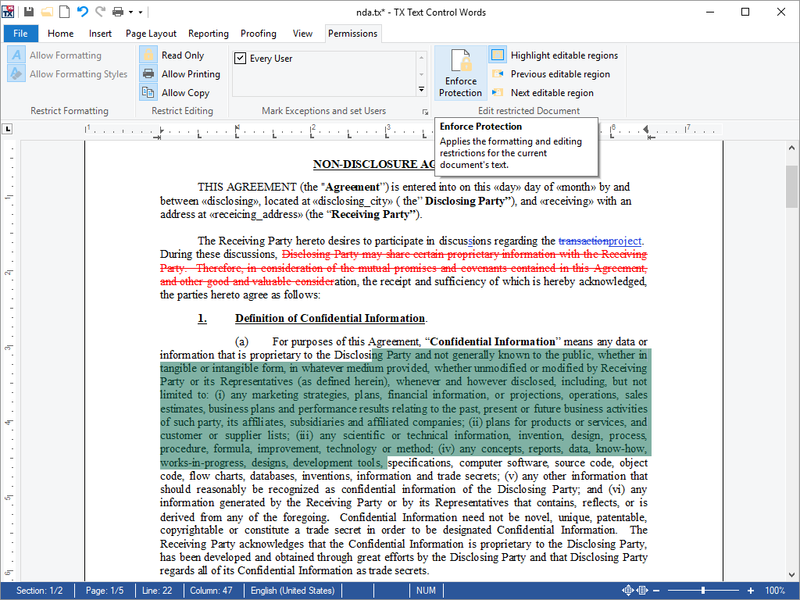 Each part, or section, can be formatted independently of all other sections in the document. Multiple page orientations: The orientation of a page in each section can be specified. This enables one document to contain pages with varying orientations. Multiple headers and footers formatting: The formatting of headers and footers can be specified on a per-section basis. This allows the headers and footers in each section in a document to be formatted independently from the headers and footers in all other sections. Multiple page sizes and margin settings: The dimensions of a specific page can be set independently of the dimensions on all other pages in a document. Similarly, the margins of a specific page can be set independently to the margins of all other pages. Section dialog box: TX Text Control .NET Server for ASP.NET ships with a dialog box that the entire document or individual sections to be formatted. 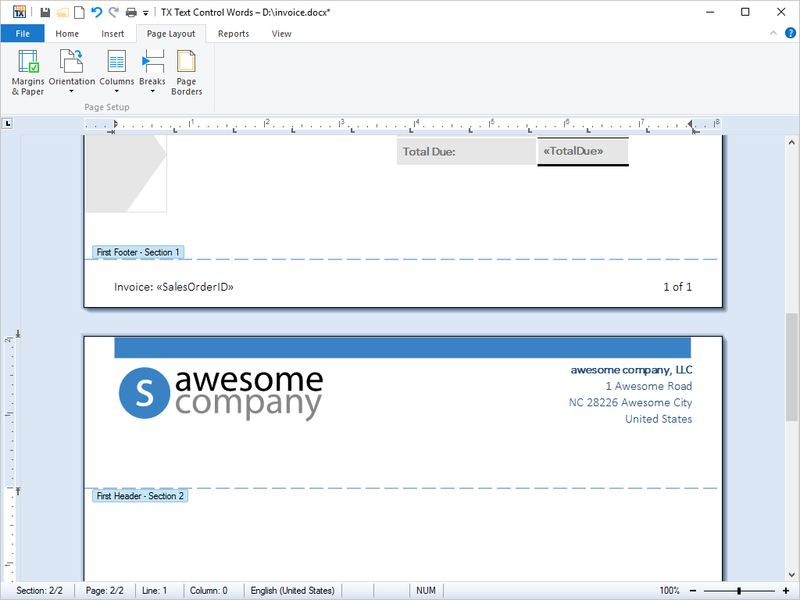 A header or footer is text or other information such as graphics or tables that is stored at the top or bottom of the page throughout a TX Text Control .NET Server for ASP.NET document. End-users can use the same header and footer throughout a document or change the header and footer for part of the document. 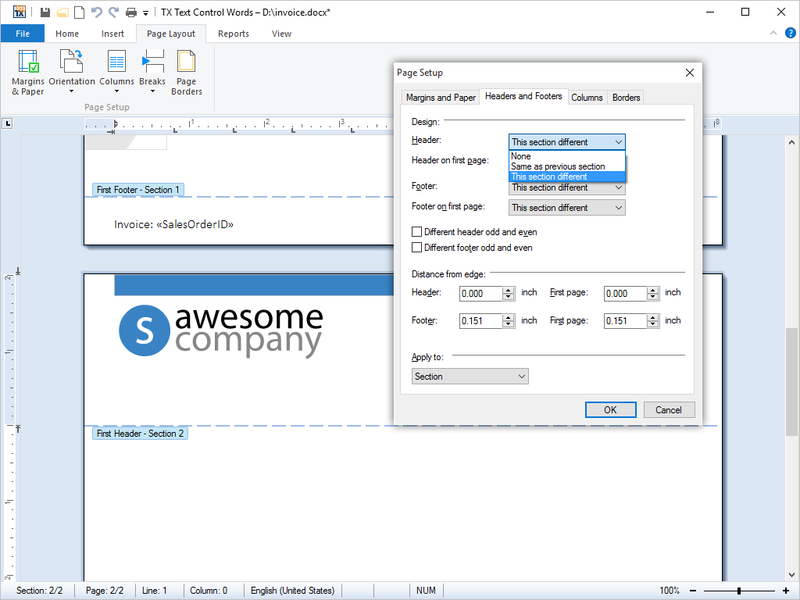 For example, end-users can add their corporate logo to the first page header, and then include the document's file name in the header for subsequent pages. All of TX Text Control .NET Server for ASP.NET's vast array of character formatting can be applied to the text that appears in a header or footer from program code. The choice of image file format is very dependent upon the application and the type of image data that is to be saved. TIFF is a standardized file format for exchanging bitmapped and grayscale images among applications. WMF is a vector graphics format for Windows-compatible computers originally designed for word processing clip art. BMP is a standardized file format used to transfer graphic images within Windows applications, designed for maximum compatibility amongst applications. JPEG is a graphical format widely used in WWW pages. 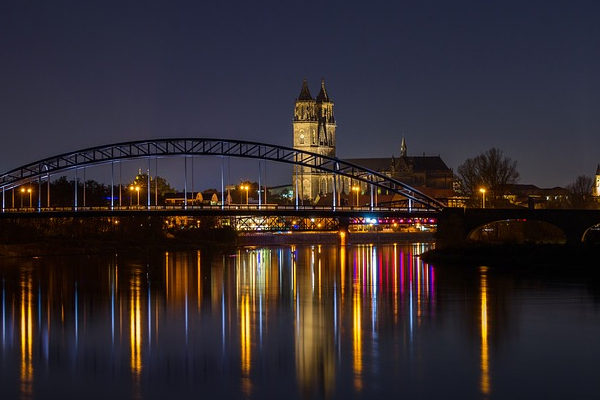 JPEG is a compressed format which can result in significantly reduced file sizes for photographs and other images with continuous color changes. GIF is the most common format for graphic images on the Internet. It is a highly compressed format that is used to display 2-dimensional raster images. It is especially suited to images containing large areas of the same color. PNG is a standard file format approved by the World Wide Web consortium to replace the GIF file format. PNG is patent and license-free. Columns are a useful word processing feature, most commonly used to present information effectively, making it easier and faster to comprehend. Any number of columns can be inserted into one document. The number of columns can be specified at the document or page level, thus allowing a different number of columns on each page, if required. 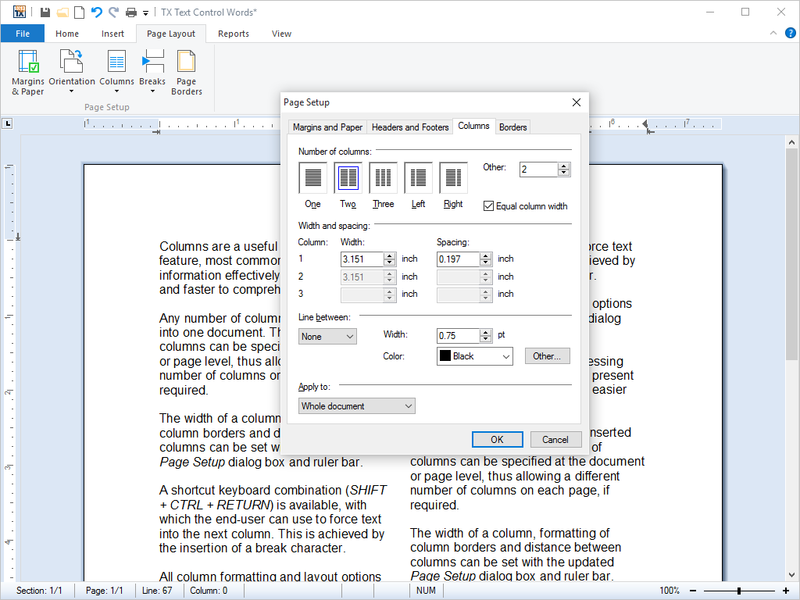 The width of a column, formatting of column borders and distance between columns can be set with the updated Page Setup dialog box and ruler bar. A shortcut keyboard combination (SHIFT + CTRL + RETURN) is available, with which the end-user can use to force text into the next column. This is achieved by the insertion of a break character. All column formatting and layout options are available in the Page Setup dialog box. Page settings define the on-screen display of a document, which includes scrollbar settings and page display. Document settings include page size, orientation, and margins, as well as the default printer for which the document is formatted. All page and document settings can be set and accessed from program code. Printing is traditionally a complex task in Microsoft Windows. 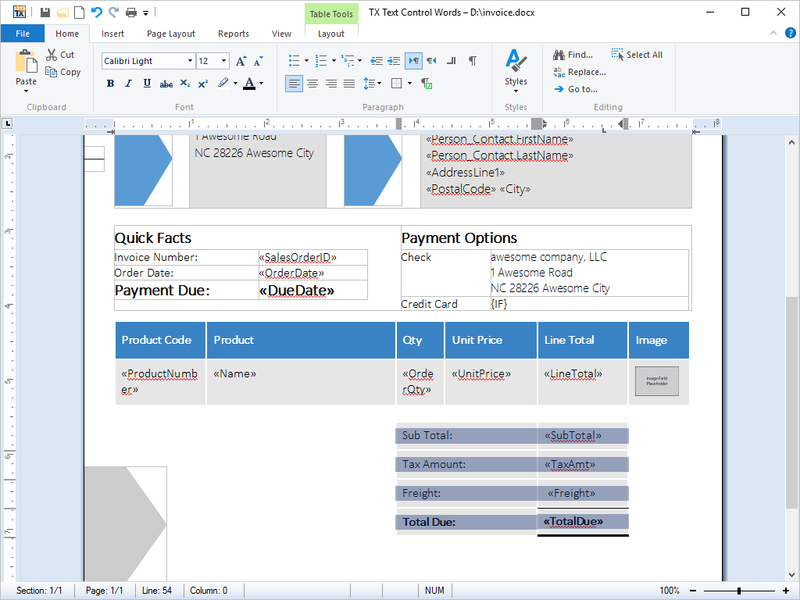 Using TX Text Control .NET Server for ASP.NET, however, only a single call is required to print multi-page documents, complete with graphics, tables, headers and footers. For developers with extreme printing demands, advanced printing functions are available to implement features such as printing multiple controls, or even mixing TX Text Control .NET Server for ASP.NET with other objects on a single printed page. Search and replace is a standard feature of all word processing applications. Typically, end-users enter search and replace terms using a dialog box, click on a button and the search and replace is performed. TX Text Control .NET Server for ASP.NET offers the same functionality, but makes it available from program code. Developers can use the search and replace functions of TX Text Control from their own server-based applications, just as end-users use a dialog box. Typical applications for this feature include searching for place holders in text based formats, such as HTML and replacing them with content. For example, searching for a particular date in old documents and updating it with today's date. Or replacing the name of a product in old product documentation, should the product be rebranded. Thanks to TX Text Control .NET Server for ASP.NET's efficient search and replace algorithm, large batch jobs can be performed in a short amount of time. 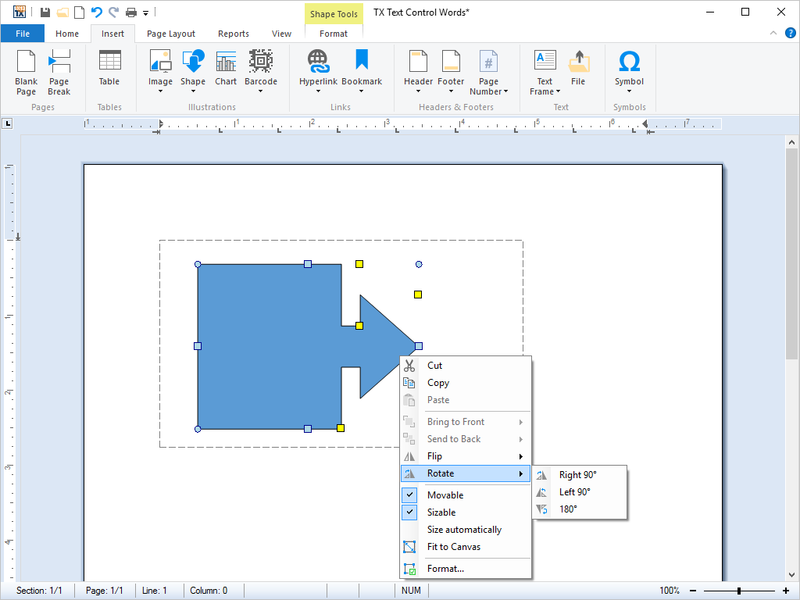 MS Word compatible drawings and shapes can be inserted and edited. Shapes can be added as single objects into TX Text Control and can be completely edited using the ribbon interface, a ready-to-use dialog box and programmatically using the TX Text Control API. When activating drawing objects, a fully featured editor is available to modify the shape. Shape objects can be also grouped in a Drawing Canvas and modified as a group. 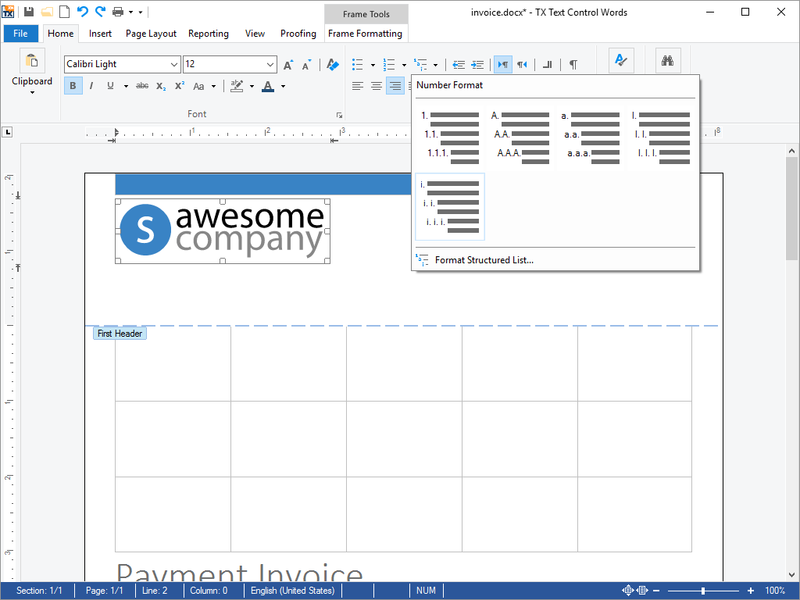 All shape types are compatible to MS Word and can be imported and exported from and to supported formats. Using TX Spell .NET you can add extremely fast, highly reliable and very accurate spell checking to your TX Text Control .NET Server for ASP.NET based applications. Built-in support for Hunspell dictionaries. American English shipped as standard. Other dictionaries are freely available. Words that are not in the selected or user dictionaries are underlined using wavy red lines. TX Spell .NET persistently checks spelling as you type, word by word and as you copy and paste. TX Spell .NET is sold separately and 100% compatible to TX Text Control .NET Server for ASP.NET. Stylesheets are a feature common to all large word processing packages. Imagine a large corpus of word processing documents, in which all the captions are formatted in 12pt Times Bold. Due to a relaunched brand, a developer is given the task of changing the font to 14pt Arial. Without stylesheets, this task would be a chore: In order to change the font, every caption would need to be programmatically selected and edited. With stylesheets, the task can be completed with a few lines of code. Stylesheets become even more important when several authors are working on the same set of documents, preventing every chapter from being formatted in a slightly different way. All of TX Text Control .NET Server for ASP.NET's stylesheet formatting options can be accessed from program code. TX Text Control .NET Server for ASP.NET' supports both paragraph and character based styles, as well as multiple style inheritance. 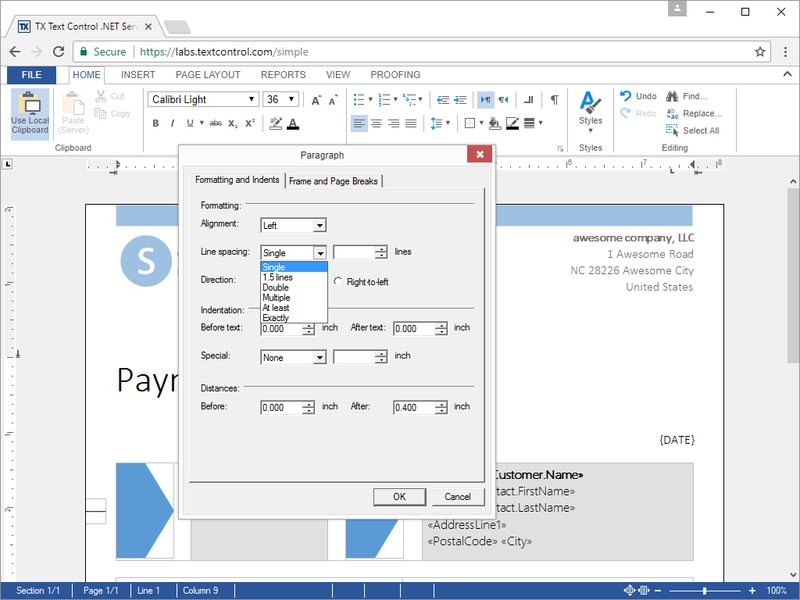 The stylesheets are compatible with MS Word, and can be used with RTF and DOC files. Tables are often used to display large amounts of data, for example in a sales report. As the maximum length of a table on any one page can only be the maximum height of the page (minus margins and headers and footers), it is necessary to divide the table every time a page break occurs. Any row in a table can be automatically added to the top of each table, right after a page break has occurred. This ensures that tables always have a table header on every page, regardless of how long they may become. The screenshots to the right, illustrates how the first row of the table is being repeated at the top of each successive page. TX Text Control .NET Server for ASP.NET provides a rich set of formatting options for tables, cells and text contained within table cells. 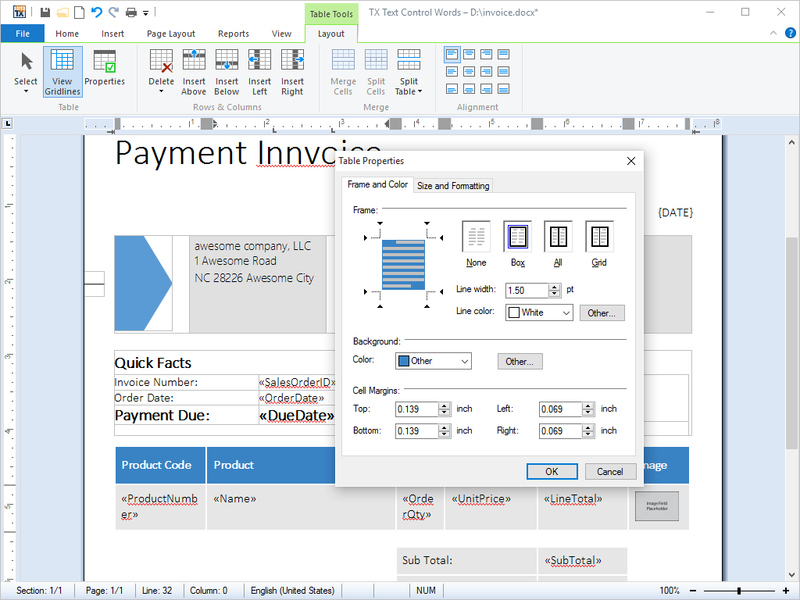 Tables can be inserted into documents or other tables using the integrated dialog box or directly from program code. 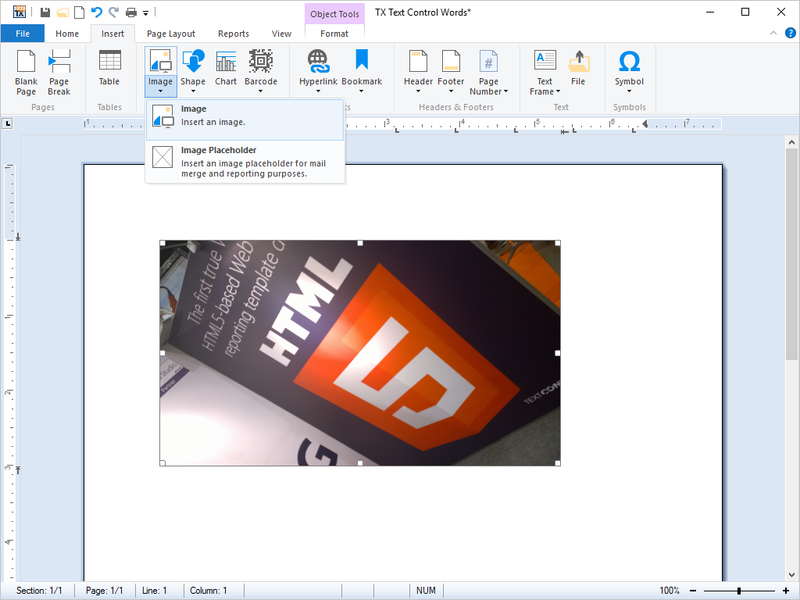 Frames and shading can be applied to cells and the cell contents can be formatted using any of TX Text Control .NET Server for ASP.NET's formatting options. Selecting a font face, setting an indent or setting line spacing, for example, for text within a table cell is performed exactly the same as for text elsewhere in a document. Cells can contain singular words or figures, entire paragraphs, graphics and even tables. Their height and width can be set independently from one another, either from program code or using the integrated dialog box. 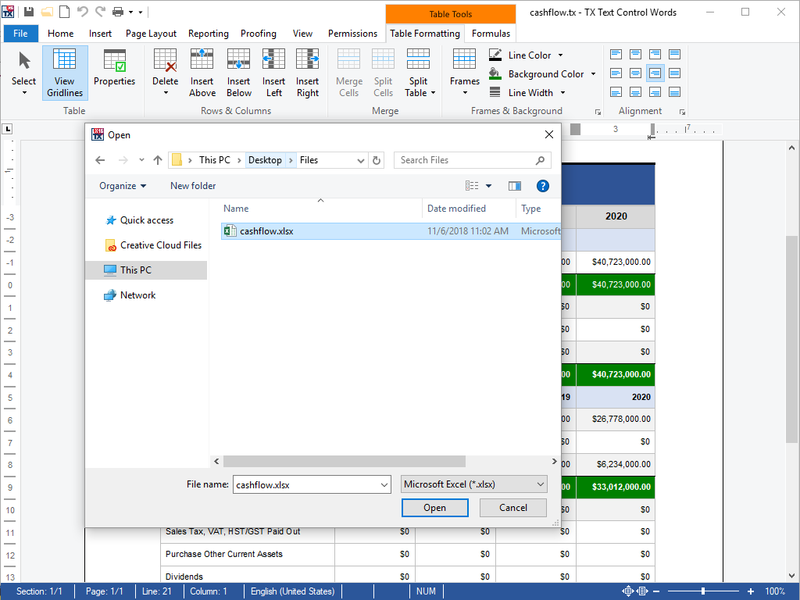 Table cells can be accessed in a grid-like manner, enabling developers to fill in their contents from a database and perform calculations on the contents of rows and columns. Text frames are rectangles that can be filled with any kind of text, tables or other data objects that TX Text Control .NET Server for ASP.NET supports. Text frames may be edited just like any other text in a document. Using TX Text Control .NET Server for ASP.NET's precise text frame positioning, end users can simply create and populate a page of labels automatically. The content of the label may consist of fully formatted text, complete with images, bar codes and logos. The resulting document can be printed to standardized printer labels and / or badges. Similarly, mail merge applications can benefit from TX Text Control .NET Server for ASP.NET's text frames. Marked text fields in a text frame can be accessed independently from other fields in the current document. This enables end users to merge all fields in a specific text frame without having to iterate through all fields in the document. All text frame settings can be accessed directly from program code or via TX Text Control .NET Server for ASP.NET's integrated dialog boxes. The behavior of text frames can be changed after inserting them into the current document. Their position, style, alignment, size or background color may be adjusted using the dialog box. This is illustrated in the animated screenshot. Multi-level undo / redo is one of the most basic features of a fully-fledged word processing application. TX Text Control .NET Server for ASP.NET records every step taken when an end-user edits a word processing document. At any time, end-users may undo the editing steps that they have taken or redo what they have undone. Programmers can implement multi-level undo / redo that can be accessed from the menu using the mouse or directly via the keyboard using a shortcut. 64 bit processors can handle much more memory and larger files than their 32 bit pendants. TX Text Control .NET Server for ASP.NET can address this much larger memory space, thus enabling developers to build high-performance word processing applications. 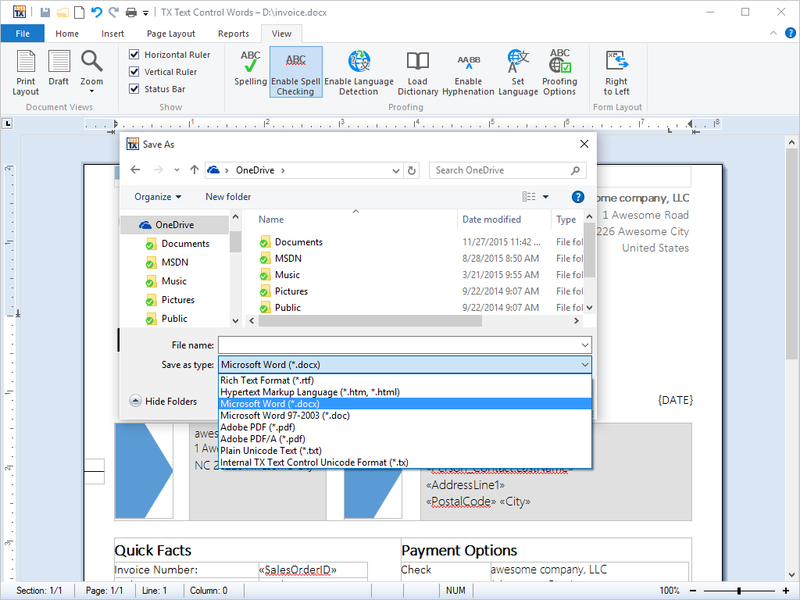 Typically, word processing applications which are built with TX Text Control .NET Server for ASP.NET can open and save much larger files than was previously possible with the 32 bit versions of TX Text Control. The ASP.NET MVC component returns standard web file formats (HTML, CSS, JS and JPG etc. ), thus documents can be displayed in the browser without having to install any third party plugins, nor extensions. The document pages are loaded asynchronously to provide a smooth user experience. Loading a document into the DocumentViewer doesn't slow down your overall page loading experience as all pages are loaded after the initialization of the control itself. Text lines can be selected on the currently active page. End-users can select text lines and copy text into the client clipboard. Documents can be directly printed from the DocumentViewer. All supported document formats that can be loaded can be also printed: RTF, DOC, HTML, DOCX and PDF. 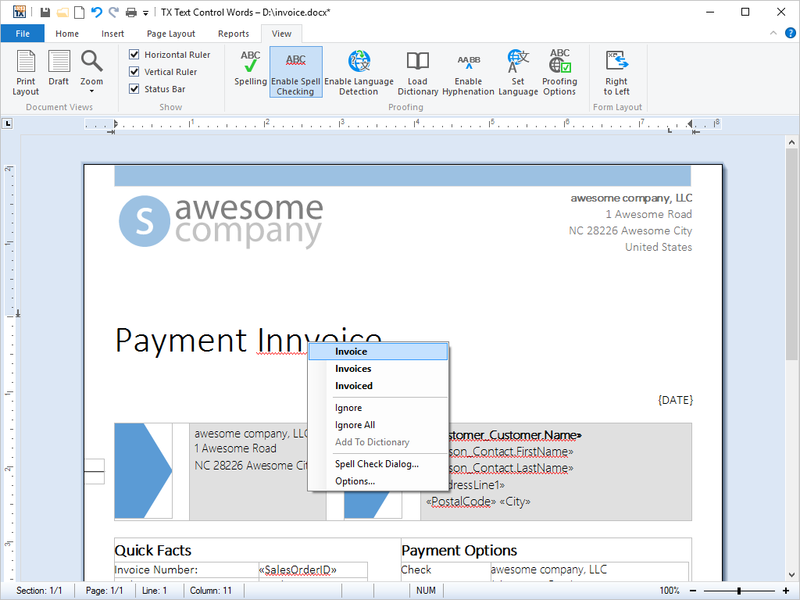 The DocumentViewer provides a find functionality to search for strings in a document. This asynchronous search method highlights the results client-side and provides a navigation option in the toolbar to navigate through the results. The DocumentViewer is fully responsive and resizes itself in any container. It can fill a container, the browser window or can be set to full screen. 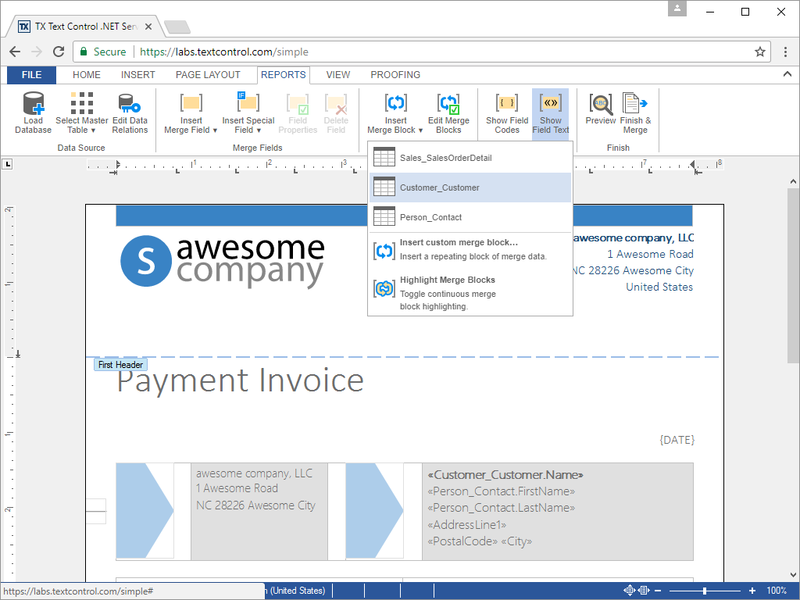 All file formats that are supported by TX Text Control .NET Server for ASP.NET are also supported by the DocumentViewer. TX Text Control .NET Server for ASP.NET offers developers access to all formatting options directly from program code. 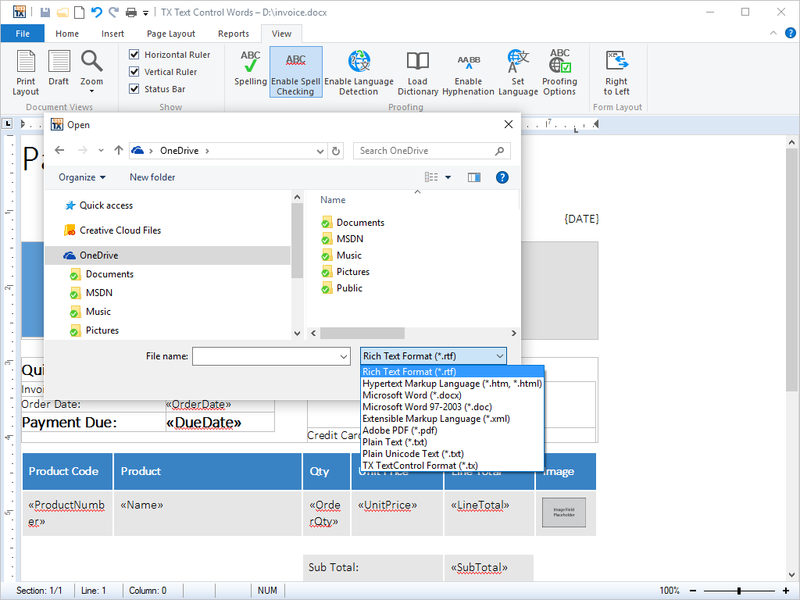 The DataSourceManager encapsulates the complete handling, logic and ready-to-use dialog boxes for the reporting template creation task. 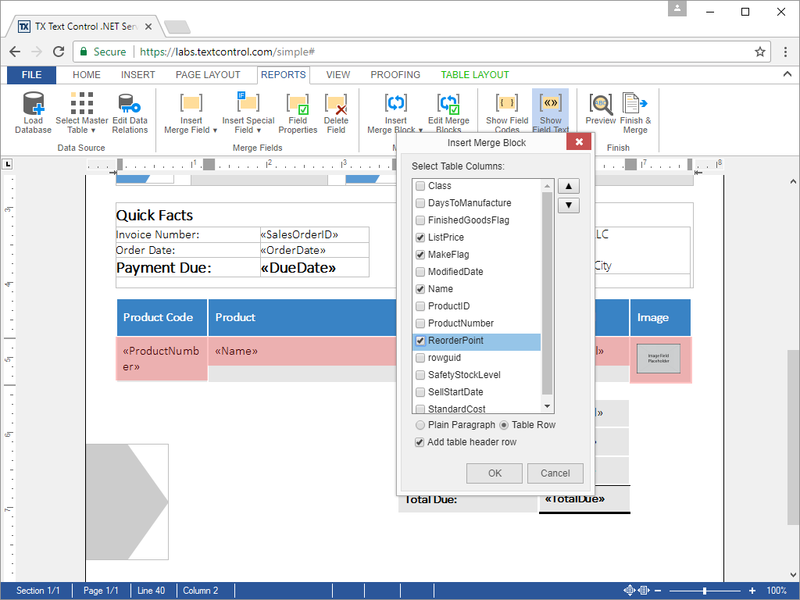 The DataSourceManager provides all information required to create a fully-featured template designer. Like with MailMerge, a data source can be loaded from a DataSet, DataTable, Json, an object or XML. In this sample, a simple .NET class is used as a data source. Using TX Text Control, documents can be protected by restricting the formatting and editing of content. When protecting a document, it is possible to define whether the document is completely locked or formatting can be applied. Editable regions are exceptions within protected documents that can be defined through a start position and a length or through a selection. These regions can be nested and overlap. Each editable region is associated with a user through the UserName property. Only this user can edit the region, when the document has been set to read only. Excel compatible formulas can be used in table cells to calculate results based on values and references to other cells in the same table. More than 100 different formulas are supported and can be combined. Typically, a SUM formula is inserted at the end of a table to create a total sum value. Or a tax value that is calculated based on a tax percentage value and the calculated total sum. TX Text Control .NET Server for ASP.NET offers several line and character operations to be performed from program code. For example, the number of characters and the number of lines in a document can be counted or the exact position of the caret on a specific line can be retrieved. Furthermore, the coordinates of a text line or character in relation to the document page can be retrieved. The mail-merge component of TX Text Control .NET Server for ASP.NET has been designed from the ground up to simplify the process of mail-merging to an absolute minimum. Using only three lines of code, it is possible to load a template, assign data, merge the data with the template and save the populated document to disk. Thanks to this simplicity, developers can achieve the highest possible levels of productivity and efficiency. A master-detail relationship is a 1:n (one-to-many) type relationship. A typical example for such a relationship is a purchase order, which contains a number of singular items. TX Text Control .NET Server for ASP.NET allows you to add nested merge blocks into a template and populate them with structured data. This allows you to created nested reports with minimum effort. In the same way that textual information can be merged into a template, as of TX Text Control .NET Server for ASP.NET you can also merge images. A typical use case of this new functionality would be a badge application, in which the name of a person, together with their photograph, could be merged into a template. Marked text fields, also known as 'macro fields', can be inserted into TX Text Control .NET Server for ASP.NET documents. 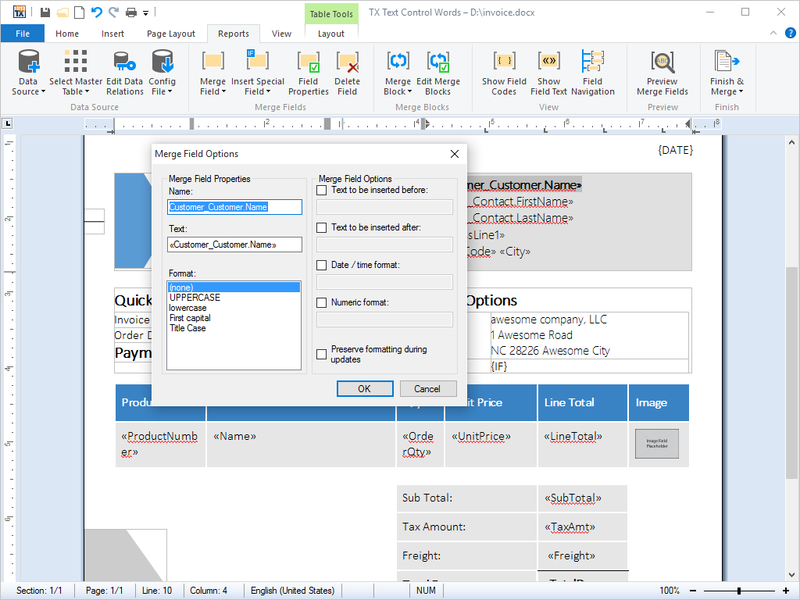 Typical applications for marked text fields include mail merging, quotation and report generation. Marked text fields are typically connected to a database, in which plain text or text formatted with any of TX Text Control .NET Server for ASP.NET rich formatting options can be loaded. The loaded data populates a previously prepared template, to create a complete word processing document. The finished document can then be printed, faxed or sent as e-mail. TX Text Control .NET Server for ASP.NET offers specialized fields for hyperlinks, targets, and page numbers. 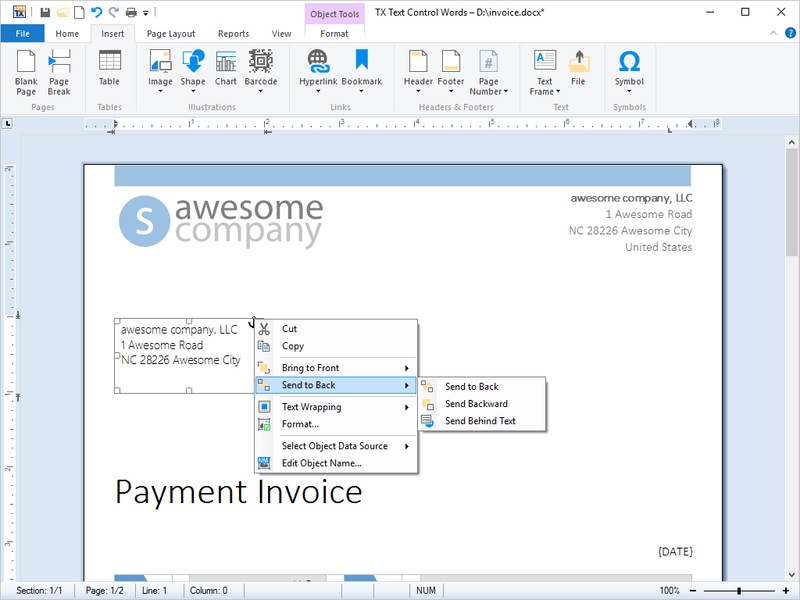 Merge fields are special fields that can be inserted into Microsoft Word documents. On demand, they can be dynamically populated with generated data or other information. 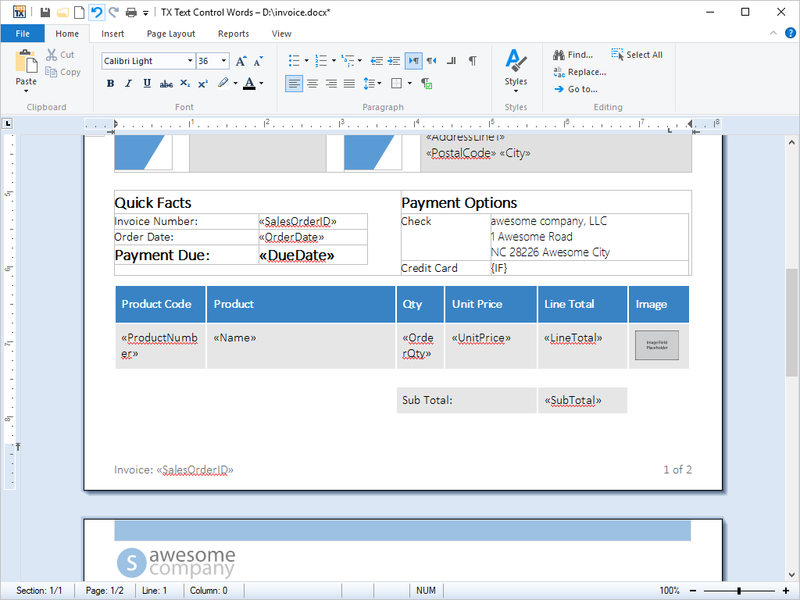 As of version 14, word processing documents that contain merge fields can be created in Microsoft Word and then imported into a TX Text Control .NET Server for ASP.NET based application. The merge fields remain in tact and can be post-processed or populated. 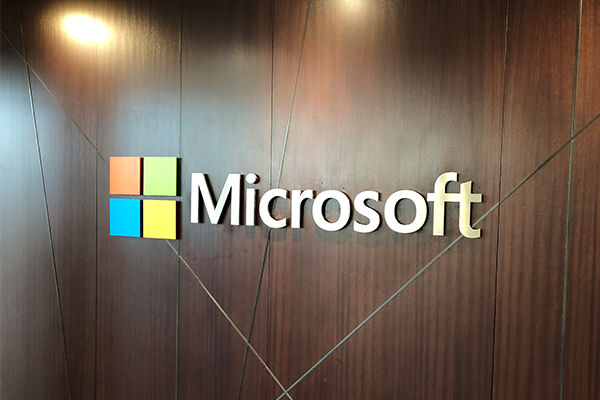 Similarly, documents that are created in a TX Text Control .NET Server for ASP.NET based application can be exported and imported into Microsoft Word. The page rendering engine allows a graphical representation of a page to be saved as either a Bitmap (BMP) in screen resolution or as an enhanced and fully scalable Windows Metafile (WMF). Pages exported as Windows Metafiles can be converted into a number of other formats, such as JPG, GIF, PNG, BMP, WMF, EMF, TIFF or ICO. The layout of the exported page image is exactly the same as that of the printed document or PDF. A typical application for this new functionality would be to generate thumbnails of all the pages in a document or to display a page-orientated view of a document in a web browser or mobile device. To provide better support to programmatically iterate through and process paragraphs, a Paragraphs collection is available. This collection is available for: i) document's main body ii) headers and footers and iii) text frames. All formatting attributes can be programmed for each Paragraph, using the ParagraphFormat and ListFormat objects. Additionally, properties are available for: i) first character, ii) first line of a paragraph, iii) number of characters and lines and iv) formatting style. A Text property and several Save methods can be used to access the paragraph's contents. The ListNumber and the ListNumberText properties provide further support for numbered lists. 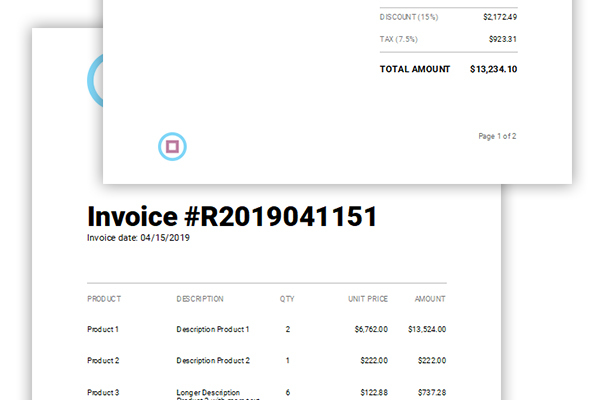 Text Control Reporting combines the power of a reporting tool and an easy-to-use word processor - fully programmable and embeddable in your application. TX Text Control is shipped with it's own Ribbon control and ready-to-use Ribbon tabs for all typical tasks of TX Text Control. 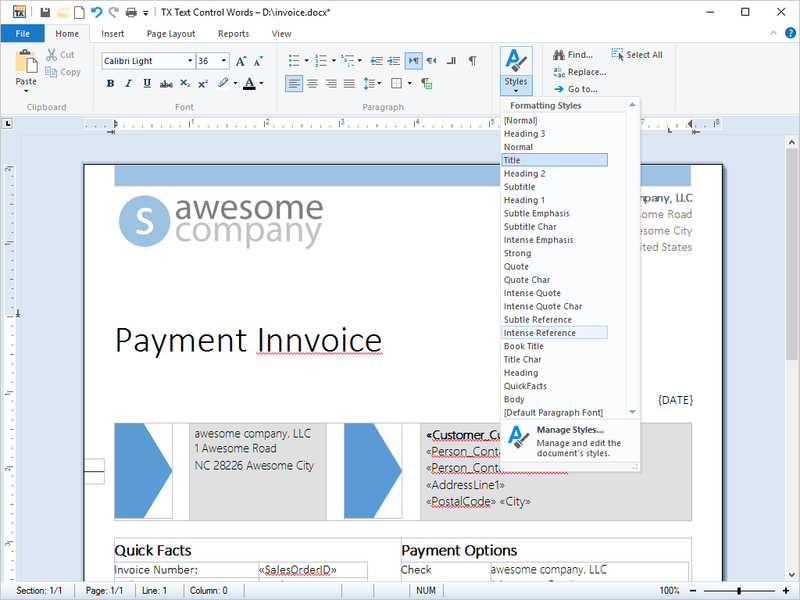 TX Text Control comes with pre-configured ribbon tabs for document formatting, inserting objects, page layout settings, reporting and mail merge, page view settings and proofing. 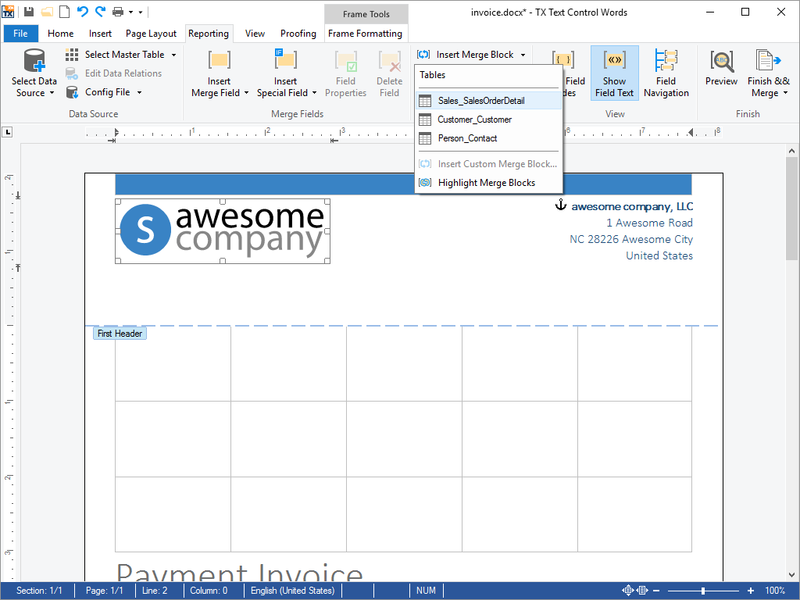 Additionally, contextual ribbon tabs are available for frame and table formatting tasks. Two of the most commonly used classes in TX Text Control .NET Server for ASP.NET are TextSelection and InputPosition. They are used to manipulate text and other elements in word processing documents from program code. The TextSelection class can be used to select parts of a word processing document and replace them with other text blocks. Using the InputPosition class, developers can retrieve information about the caret's current line, column and page. Additionally, the caret position can be changed and text can be inserted into any part of the document. This redlining feature is very helpful when working on the same document with multiple authors specifically with legal or healthcare documents where changes need to be tracked and safely logged. The track changes feature is fully programmable using the TX Text Control API. For each TrackedChange, you can retrieve the timestamp, the kind of the change, position, text, highlight colors and the associated author name. Unicode is a character encoding standard developed by the Unicode Consortium. The aim of the standard is to provide universal way of encoding characters of any language, regardless of the computer system, or platform, being used. The core of Unicode, known as the Basic Multilingual Plane, contains space for over 65,000 characters. These include some 49,000 characters from the world's languages, include letters from alphabets, ideographs used in writing systems such as Chinese, and other characters such as currency and mathematical symbols. In addition to these, space is available for custom use, and supplementary code points are available for characters used in languages such as Chinese, where the total number of characters is not quantifiable. Thanks to TX Text Control .NET Server for ASP.NET's Unicode support, applications can be developed in very wide range of languages. Full details of which languages are supported are available on request. One of TX Text Control .NET Server for ASP.NET's most popular areas of deployment is in the area of document conversion. 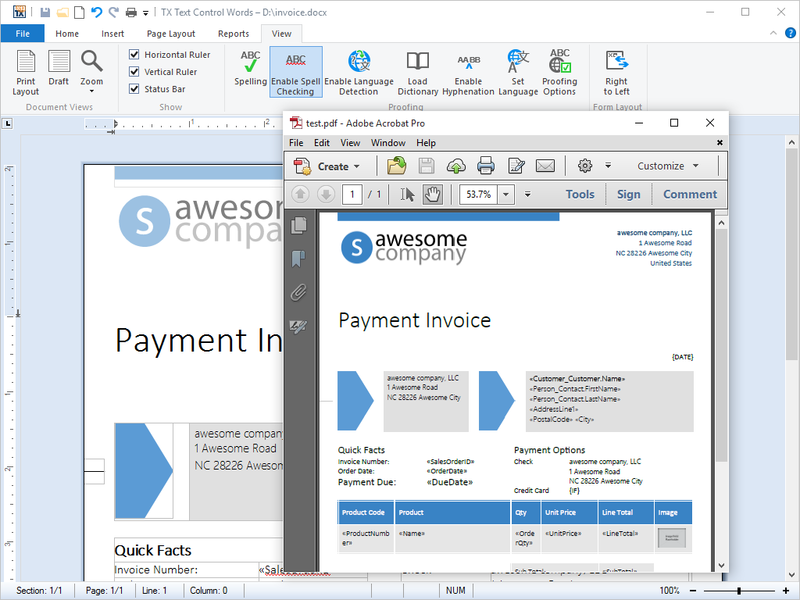 Word processing documents can be loaded in any of the formats supported by TX Text Control .NET Server for ASP.NET (amongst others, MS Word, XML, RTF or HTML) and saved to any other supported format. 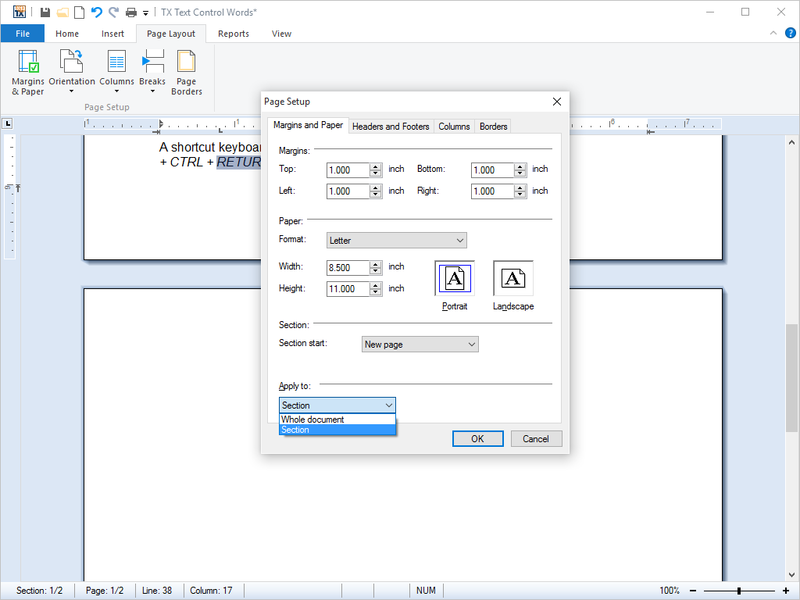 Consider the following scenario: an end-user has created a richly formatted document, complete with graphics, headers, footers and tables and has saved it as an RTF file to his/her local hard disk. A server-side, TX Text Control .NET Server for ASP.NET based application can easily be created that accepts the end-user's RTF file via HTTP, converts it to a format of the end-user's choice (for example, PDF) and then sends it back to the end-users browser. Another typical scenario is in the area of web publishing. An end-user could create a Microsoft Word document, upload it to a web server, upon which TX Text Control .NET Server for ASP.NET is running. TX Text Control .NET Server for ASP.NET can easily load this document, save it as HTML and copy it to a world readable directory, thus making it accessible to world-wide audience on the Internet. 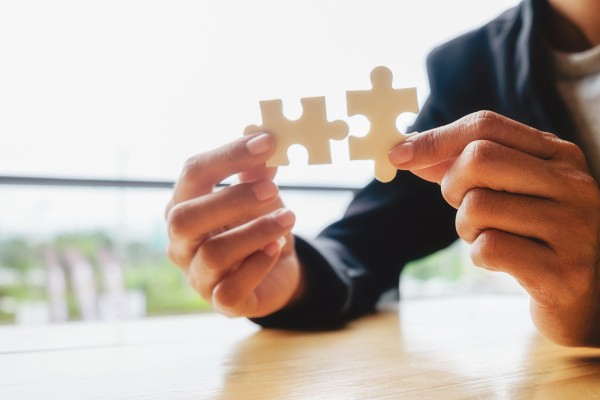 Today's business processes demand that information is immediately accessible to stakeholders inside and outside a company. Typically, this information needs to be available in a wide range of formats and customizable for every reader. Using TX Text Control .NET Server for ASP.NET, a print-ready document can be generated on-the-fly using information from a set of databases and user data from a web browser. The resulting document can be displayed in the browser, saved to disk or sent by e-mail. As documents are generated on-the-fly, they are not physically stored on the server. This reduces redundancy and at the same time, gives end-users direct access to up-to-date, live information. One TX Text Control .NET Server for ASP.NET license is valid for one developer and one server. In addition, the TX Text Control .NET Server for ASP.NET license includes one Enterprise client license for client-side development. Five developers are working on one TX Text Control .NET Server for ASP.NET based application: Five developer licenses are required. A developer license includes one run time license. This run time license can be transferred to end-user customers when the end-user application is sold. Four TX Text Control .NET Server for ASP.NET based applications are running on one server: one TX Text Control .NET Server for ASP.NET license is required. Four TX Text Control .NET Server for ASP.NET based applications are installed on three servers: three TX Text Control .NET Server for ASP.NET licenses are required. Using TX Text Control .NET Server for ASP.NET, word processing documents can be assembled from various data sources, such as databases and physical files, thus enabling a range of mail merge applications. Mail merging is a popular application in an office environment. Paper-based mail shots, e-mail newsletters, quote generation, form letters are typical applications that can benefit from TX Text Control .NET Server for ASP.NET's, flexible mail merge handling. Consider the following scenario: A system administrator has created a TX Text Control .NET Server for ASP.NET based server application that allows end-users to send mail-merged letters to a selection of customers from a customer database. The end-user is presented with a web based interface, and simply needs to select the records to which the letter should be sent and then upload the template in to which the data should be populated. The end-user can then start the batch job and do something useful with her/his time, while TX Text Control .NET Server for ASP.NET is processing and printing the letters. Adobe's Portable Document Format (PDF) has quickly become a standard for platform independent, print-ready and e-mail/web destined documents. Word processing documents exported as PDF files can be viewed on a variety of operating systems and hardware. PDF readers are available for devices ranging from cell phones, via PDAs to fully fledged desktop PCs. 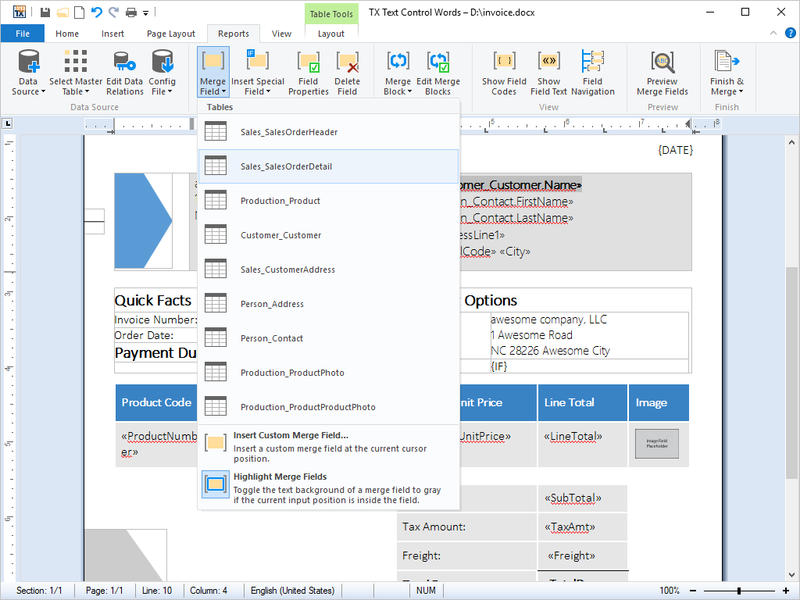 Using TX Text Control .NET Server for ASP.NET's built in PDF export, developers can generate documents on the fly from a variety of data sources and make them available to a very wide audience. When images are embedded in a document with their complete binary data, it can be useful to alter an image's resolution and the quality of the data compression algorithm to minimize the file size. TX Text Control .NET Server for ASP.NET allows this parameterization from program code. No further third party software or plug-ins are necessary. Exporting to PDF is just as easy as saving to any other of TX Text Control .NET Server for ASP.NET's supported formats. 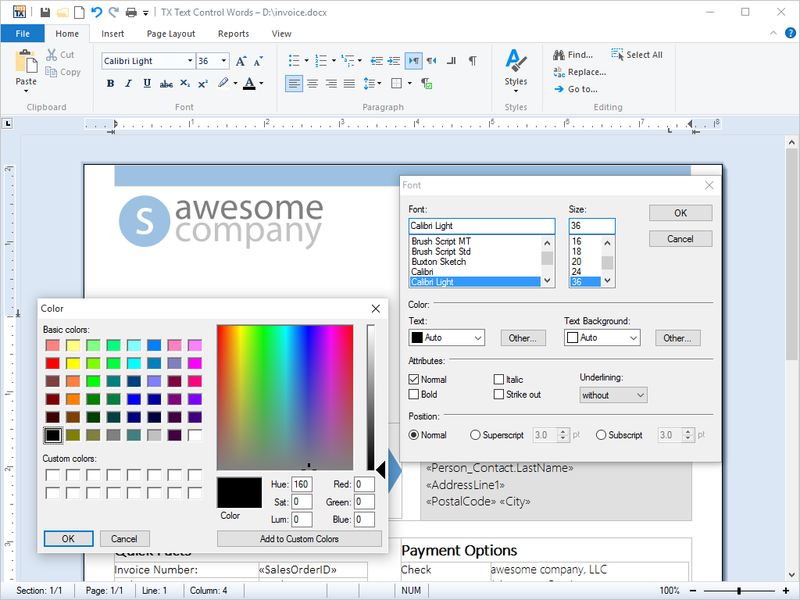 The first true WYSIWYG, HTML5-based Web editor and reporting template designer. 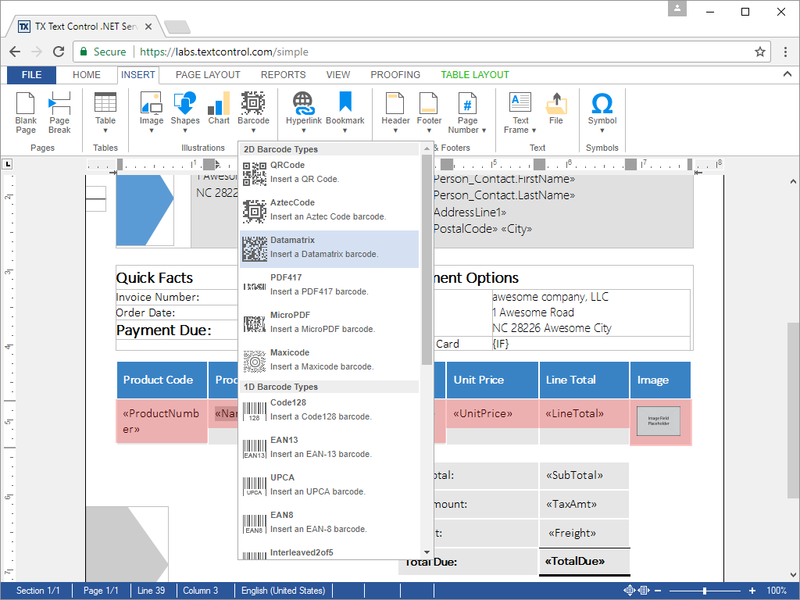 Give your users an MS Word compatible editor to create powerful reporting templates anywhere - in any HTML5-based browser including Google Chrome, Firefox, Safari and Internet Explorer. Based on MS Word compatible report templates, mail merge and table reports to master-detail, side-by-side and sub-reports can be created. Nested repeating blocks with master-detail relationship views can be easily inserted. It doesn't matter what's repeated in the block: A table row, paragraphs, images or text frames. There are no limits. Zero footprint - no plug-ins, nothing! More zero? Zero client-side installations, zero requirements, zero maintenance and zero security settings. Neat? Neat! Cascading Style Sheets (CSS) is a stylesheet language that allows authors and end-users to attach formatting, such as fonts, spacing and paragraph settings, to structured XML documents. By separating the presentation formatting of documents from the actual content of documents, CSS simplifies document authoring and maintenance. 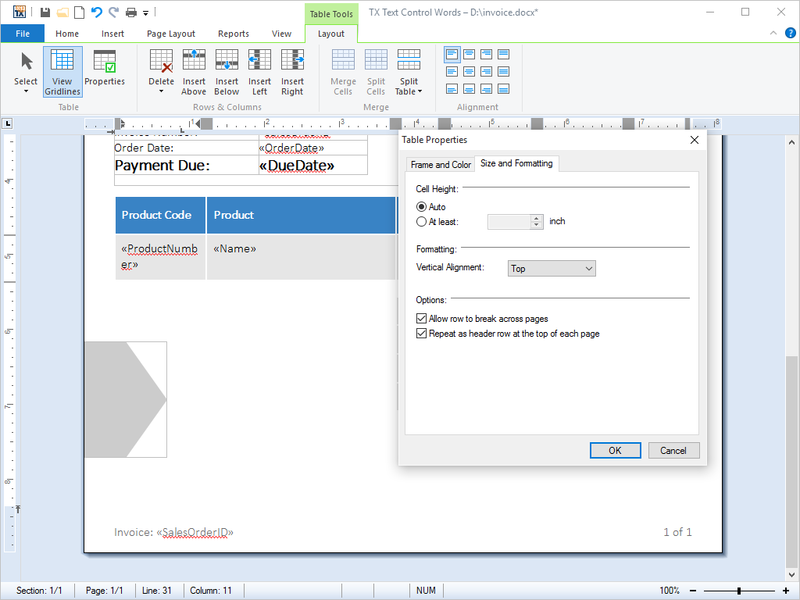 Styles can be defined using the shipped dialog box or directly from program code using the rich set of properties and methods that TX Text Control .NET Server for ASP.NET makes available. Styles that have been defined using TX Text Control .NET Server for ASP.NET's style sheets can be exported to a CSS file. The resulting CSS file can be used in other word processing and Internet documents. Microsoft Word (DOC) is a binary word processing format developed by Microsoft. It has become the de facto standard due to the popularity of the word processing application Microsoft Word. TX Text Control .NET Server for ASP.NET can load and save files in DOC format. All available TX Text Control .NET Server for ASP.NET features are supported, including tables, images, headers and footers, OLE objects and bullets and numbered lists. Furthermore, any file format that can be loaded into TX Text Control .NET Server for ASP.NET can be saved as HTML. Thus, document format conversion applications can be created with ease. With the 2007 version of Word, Microsoft introduced the DOCX file format, intended as a successor to its binary Microsoft Office file format. DOCX is a combination of XML architecture and ZIP compression for size reduction, and has become a de facto standard in word processing document formats. Using the shipped open and save dialog boxes of TX Text Control .NET Server for ASP.NET files can be opened and saved in the DOCX file format. All supported features of TX Text Control can be exported and imported to and from DOCX files. A Document Type Definition (DTD) is a collection of XML markup declarations that, as a collection, defines the legal structure, elements and attributes that are available for use in a document that complies to the DTD. When loading an XML file, TX Text Control .NET Server for ASP.NET automatically looks for the corresponding DTD on the local file system, from a network path or over the Internet. Once the XML file is loaded, TX Text Control .NET Server for ASP.NET is able to prevent end-user from applying changes that would invalidate the XML contents using the associated DTD. Originally developed as the authoring language for documents on the Internet, Hypertext Markup Language (HTML) is quickly becoming a universal word processing format. Nowadays, HTML can be viewed on devices ranging from fully fledged desktops, via Personal Digital Assistants (PDAs) to miniature cell phone displays. Thanks to TX Text Control .NET Server for ASP.NET rich set of properties and methods for the manipulation of HTML, implementing a 'Save to HTML' feature is one line of code. Saving to HTML is just as easy as saving to any of the other file formats that TX Text Control .NET Server for ASP.NET supports. In addition, when text that is formated as HTML is copied into the clipboard, its formatting is retained. On pasting the clipboard back into a word processing document, the text is imported as HTML. Portable Document Format (PDF) is a file format originally created by Adobe, to provide a standard form for storing and editing printed publishable documents. As PDF documents can easily be seen and printed by end-users on a variety of computer and platform types, they are very common deployed on the Internet and are often used as the format of choice when end-users exchange documents via e-mail. PDF files retain the 'look and feel' of the original document with special formatting, graphics, and color intact. TX Text Control .NET Server for ASP.NET allows documents to be saved directly to Adobe Portable Document Format (PDF), without the need for any further third party software or cumbersome printer drivers. Using the traditional approach to PDF creation, it is necessary to print a document to a file and then use a PS to PDF converter (such as Adobe Distiller) to convert the print file to a PDF file. While technologically possible, it is a clumsy solution and taxing on the end-user. 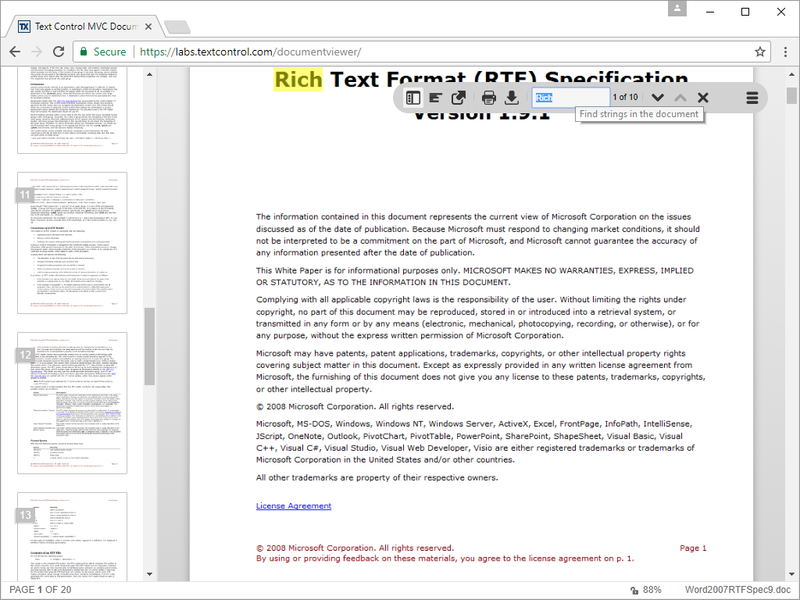 Furthermore, as of version 17.0, TX Text Control .NET Server for ASP.NET supports digital signatures in Adobe PDF/A documents. Signatures can be created with PFX, DER Cer or Base64 CER certificate files. Existing PDF documents, for which the original source files no longer exist, can be imported into TX Text Control .NET Server for ASP.NET, upon which they can be edited and saved to any supported file format. Calculating the layout of a page from an imported PDF, however, is a tricky process: PDF files contain detailed information about the appearance of a page, but not necessarily about the meaning of the characters and images contained within a page. Furthermore, PDF files do not usually contain any information about the order of text, text flow, nor whether a piece of text is part of a header or table cell. Although recent additions to the PDF specification allow for some of this information to be stored (tagged PDF), this is rarely used. TX Text Control .NET Server for ASP.NET extracts and converts all of the text it can find, adds missing spaces and paragraph breaks, and re-sorts the various text blocks and images, so that they appear in their logical order. GenerateLines: The imported document is built from singular lines of text, terminated by a line break. This option is most suitable, if only the textual content of the PDF file is of interest. GenerateParagraphs: The singular lines of text are grouped together to form paragraphs. 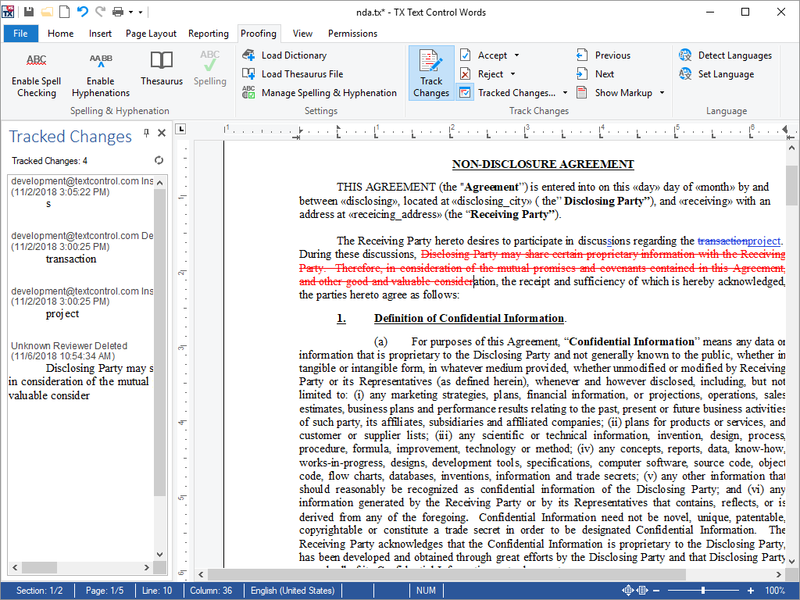 This option eases post-import editing and is most suited to text heavy documents, such as legal contracts. GenerateTextFrames: The imported blocks of text and images are organized into text frames and placed at the same position as in the original PDF file. This option produces documents, which are most similar to the original. PDF/A is a self-contained, device independent file format for the long-term archiving of page-oriented documents. The ISO ratified standard (ISO 19005-1:2005) was developed by a working group of representatives from government, industry and academia. All supported TX Text Control .NET Server for ASP.NET formats can be exported to PDF/A-1b. Only embeddable fonts are saved. Font data is stored, specifying which characters of a font have been used. A color profile is saved. Links to start other applications are not permitted. Access restrictions are not permitted. TX Text Control .NET Server for ASP.NET supports digital signatures in Adobe PDF/A documents. Signatures can be created with PFX, DER Cer or Base64 CER certificate files. Rich Text Fomat (RTF) is a file format developed by Microsoft that allows end-users to save text files, keeping their formatting, font information, text color in tact. It is supported by virtually all word processing applications and is thus one of the best suited formats when it comes to exchanging data between different applications. TX Text Control .NET Server for ASP.NET can load and save RTF. In addition, when text that is formated as RTF is copied into the clipboard, its formatting is retained. On pasting the clipboard back into a word processing document, the text is imported as RTF. 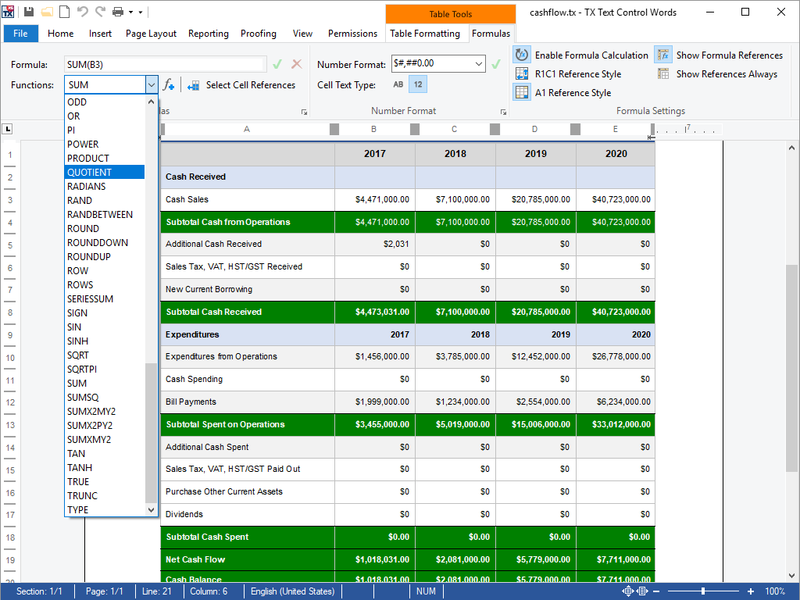 Spreadsheet tables can be imported from Microsoft Excel (XSLS) documents. 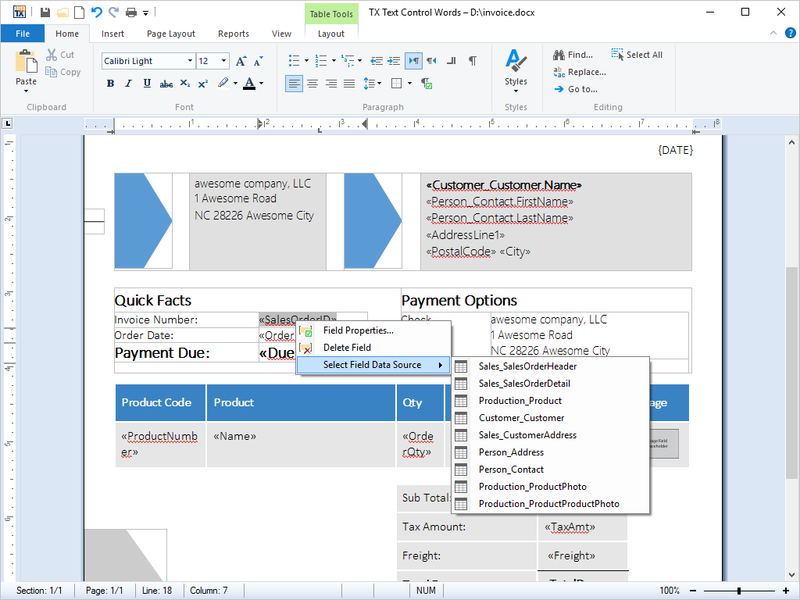 When opening a document, users can choose from a list of available spreadsheets. 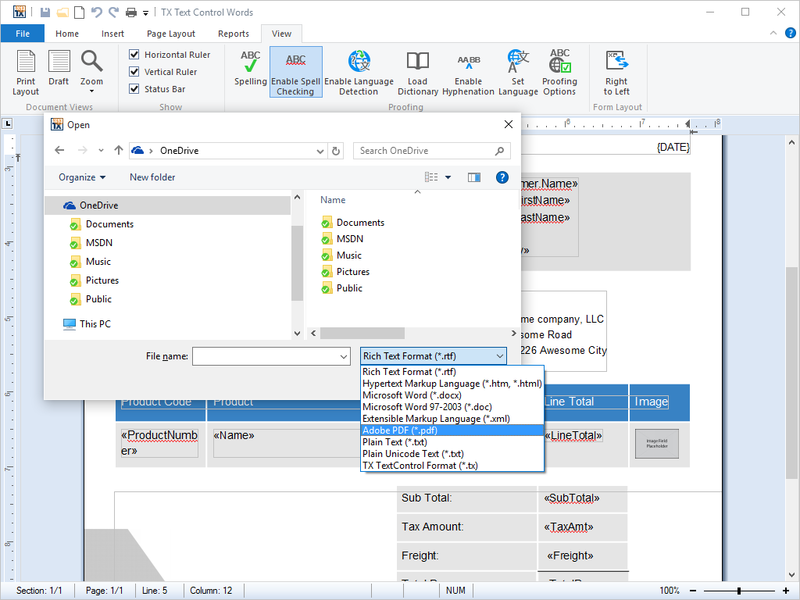 In TX Text Control, Excel compatible formulas can be imported to calculate results based on values and references to other cells in the same table. More than 100 different formulas are supported and can be combined. Extensible Markup Language (XML) is the universal format in which to exchange data between applications and on the Internet. XML allows developers to easily describe and deliver rich, structured data from any application in a standard, consistent way. XML does not replace other file formats supported by TX Text Control .NET Server for ASP.NET; rather, it compliments them. To the developer, TX Text Control .NET Server for ASP.NET offers a rich set of properties and methods for manipulating XML documents and stylesheets from program code. ASP.NET - the latest incarnation of Microsoft's middleware for the Internet - is built upon the .NET Framework. It is the environment that supports developers who use the .NET Framework to develop web-based applications. It is bundled with Internet Information Server (IIS). The fundamental idea is that HTML pages can be created with little embedded bits of Visual Basic, C# or other languages, that are interpreted by the server. TX Text Control .NET Server for ASP.NET is deployed as an automation server on Microsoft Internet Information Server (IIS). All properties and methods are available in ASP.NET projects, making TX Text Control .NET Server for ASP.NET ideally suitable for web server applications. What's New in TX Text Control X16?